Hello and welcome to the most frequently read page on our website. If you’re like most people reading this, you are new to the idea of purchasing an above ground pool and have no idea where start. North Florida Above Ground Pools has installed thousands of swimming pools of all makes and models over the years and we are here to help you through the process. Besides, who’s better to ask than someone who has seen and installed them all. Most people just want a good long lasting pool that will be easy to maintain and they don’t want to get ripped off in the process. No one wants to over pay and they don’t want to but junk either. So we have also simplified the process by giving you the short and sweet version of what to buy, where to buy it and why it’s good. Like anything else, some pools are better than others. 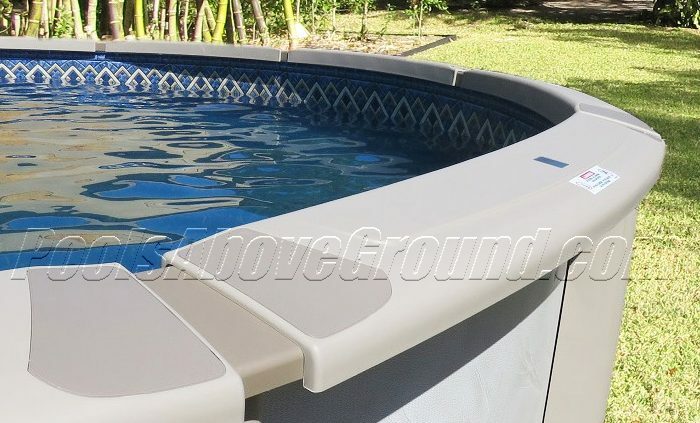 Basically when shopping for a new above ground pool it breaks down into three main pool components to consider, the pool, liner and equipment. All should all be made in the USA end of story. Why? 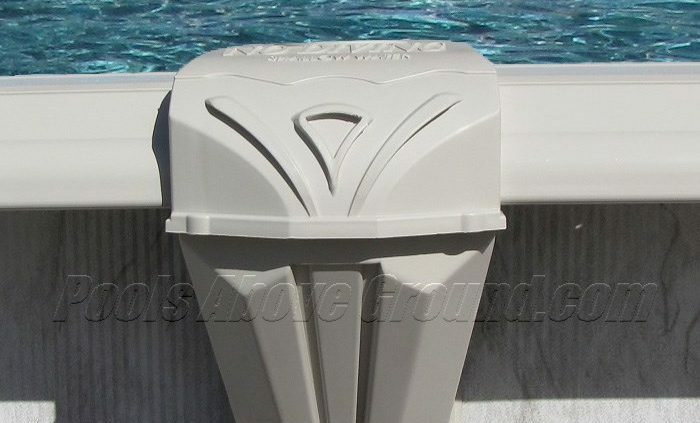 Because American made pool products are better quality than the imported ones and you can always get replacement parts for name brand American products anywhere. And when I say American made pool I’m referring to the typical American made hard-wall or steel wall above ground pools. These tend to last an average of 15-20 years in Florida. The imported hard-wall pools last about 5-8 years while soft side and blow up pools tend to last only 1-2 years. If you are shopping for pools under $1000.00, I suggest waiting until you have a larger budget to spend. Pools in this price range can often be more trouble than you bargain for. 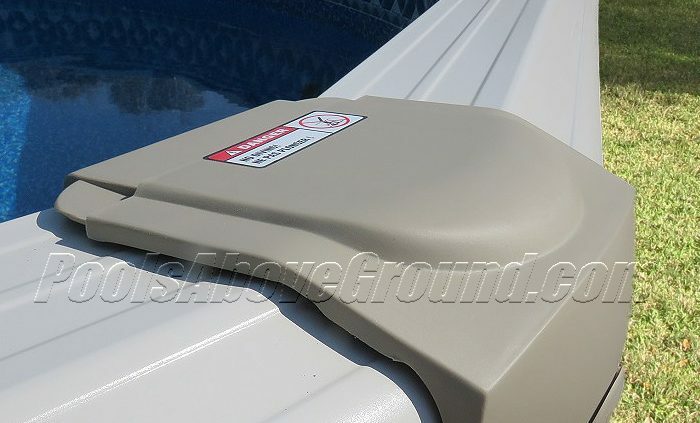 Soft sided pools from Walmart, Target and other big box stores include models from Intex, Coleman, Ultra Frame and others. These pools usually only last about 1-2 years and most people are so disappointed they shop for a different one the very next swim season. Aside from the fact they’re made from inferior materials, the pump and filter systems aren’t strong enough to circulate the pool water properly or run a vacuum for cleaning. This leads to green pool water and muck on the bottom. This is not what people signed up for when making their pool purchase. I recommend PoolsAboveGround.com. Where you buy your pool from can be as important as what pool you buy. I recommend these guys because they’re been right here in Florida for decades. They’re honest, friendly, sell only good stuff and really know above ground pools. If you are doing the pool install yourself you’ll really appreciate the live tech support. And if you have any parts issues you’ll be glad to know they remedy them immediately. Another big reason is you can always get someone on the phone. I have sent many customers to Pools Above Ground over the years and honestly I don’t know what more you could ask for. If you’re doing the install yourself or having a professional do the install you may want to start with a good pool and great dealer support. This will ensure you have a pool that last for decades and a dealer you can count on when you need them. Now on to the goods. We selected three pool models from them as our Best Pools To Buy based on their brand, features, accessories, price, speed and company support. Why It’s Good- First, it’s likely to be the last pool you’ll ever buy. Aside from that Caspian has many reasons to be considered the best resin above ground pool. For starters it’s warrantied for use with freshwater or saltwater. This means you can safely use any water sanitizer you wish. Chlorine, Baquacil, or saltwater system and all covered by the manufacturer. This is possible by the maker using as much resin in it’s construction as possible. Resin Construction- Resin is a high grade polymer material that’s used in pool construction because it’s durable, lasts a long time and is corrosion resistant. Because resin bounces back from impact, doesn’t dent or get hot to the touch it’s a great material for use in swimming pools. Resin doesn’t rust or corrode like metal, so it’s great when used with saltwater systems or near the salty ocean air of the North Florida coast. Here is a list of the solid resin parts included in Caspian. 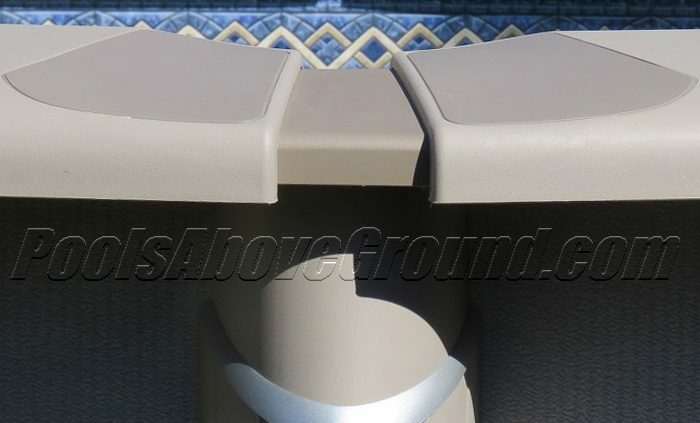 9″wide heavy duty injection molded top ledges, upright posts, frame rails, stabilizer bar, base plates, top plates and two piece top caps. USA- Caspian is made by Wilbar International in Long Island New York. Wilbar is the largest and one of the oldest pool makers in the United States. This gives meaning to having a warranty. This also ensures finding replacements parts in the future will be possible. Try doing that with pools imported from overseas. 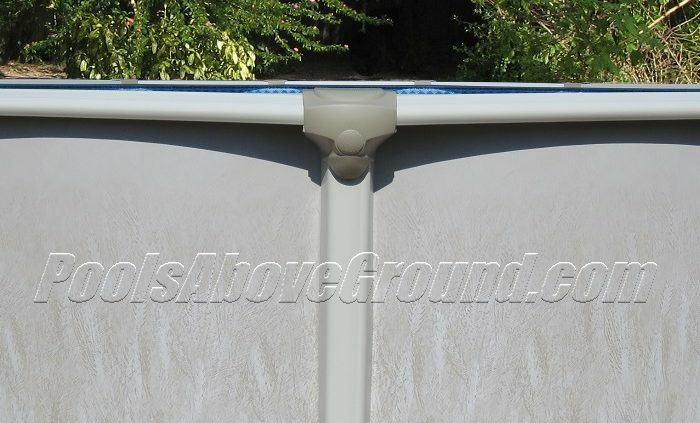 Wilbar pools are also made of thicker and better grade materials than many others. This isn’t always something you can see or feel but it becomes apparent when your imported pool model rusts away in few years. Inferior thinner steel and a lack of protective coatings make for a short life. I have never seen an imported pool older than 8 years. The sad part is the imported pool isn’t any cheaper, so shop smart. Stainless Steel- While on the subject of steel it’s important to mention that the skimmer opening is the most common failure point in all above ground pools. To prevent this from being an issue the Caspian also includes a stainless steel panel where the skimmer and return jet are located. As you already know, stainless steel doesn’t rust so this common problem area will outlast the pool itself. Great feature and one that will likely extend the life of your investment. Want More Info?- To buy Caspian pool or view pricing click here. Why It’s Good- The Montego pool model is one tough cookie. Montego made the grade because it’s built to really last and has a surprisingly low price tag. Let’s start with the rugged nature of this pool. 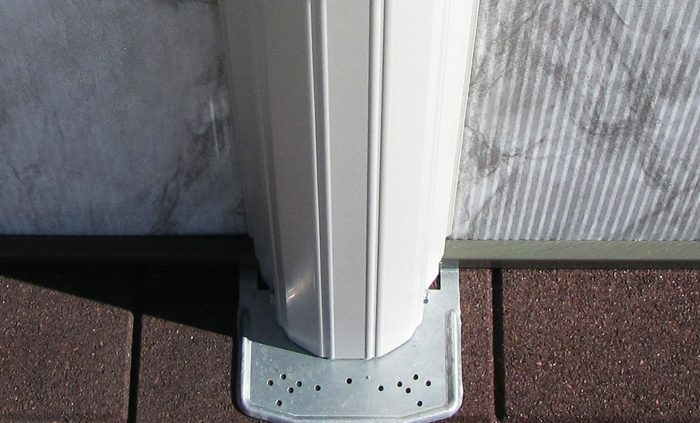 The frame rails base plate, upright posts and especially the top ledges are extremely well made. The extra material that went into this model makes it much stronger and durable the the entry level pools. All of this comes at a price of only a couple of hundred dollars more on the average 24′ round pool. 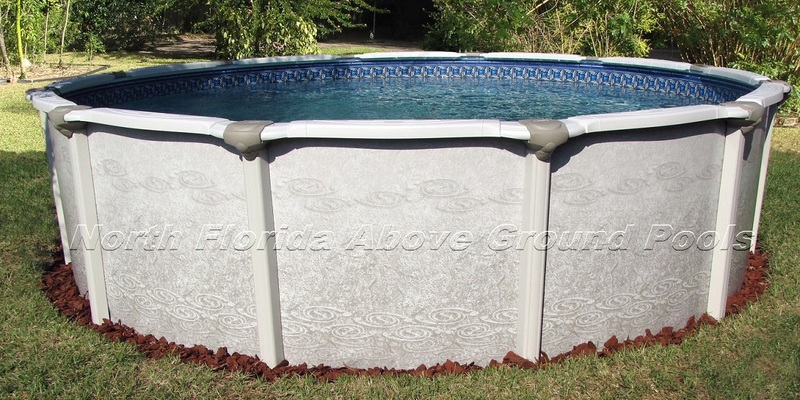 That price gap does get wider when we talk about oval shaped models, but it’s still far less expensive than the resin top pools and still comes with the desirable buttress free or yardmore design. Buttress free just means there are no unsightly beams or legs sticking way out on the sides of the pool. This design is cleaner looking and takes up less space width-wise on the ground. A real concern for those with narrow spaces to contend with. This model would do well with large families or anyone seeking a very solid long lasting pool at a very affordable price-point. If a saltwater system isn’t on your shopping list or resin parts seem unnecessary, Montego is the pool for you. I would expect 15+ years of service from the model. USA- Montego is made by Wilbar International in Long Island New York. Wilbar is the largest and one of the oldest pool makers in the United States. This gives meaning to having a warranty. This also ensures finding replacements parts in the future will be possible. Try doing that with pools imported from overseas. Want More Info?- To buy Montego pool or view pricing click here. Why It’s Good- First, it’s likely to last a lifetime. Aside from that Southern Sea has many other reasons to be considered the best above ground pool for Jacksonville FL. Probably the biggest reason is it can have a deep end swimming area. We get a ton of people asking if there’s such thing as an oval pool with a deep end and where can they buy one. Having a pool that can be any depth up to 7 feet is quite unique and becoming very popular with people searching for an affordable inground pool alternative. We chose this one as a best pick because PoolsAboveGround.com offers this model at a much lower price than any Doughboy pool dealer around. You can save anywhere from $1000-$2000 shopping there. This is where many Florida pool stores get theirs before marking them up to you. Saltwater Warranty- Southern Sea is covered for use with freshwater or a saltwater system. This means you can safely use any water sanitizer you wish. Chlorine, Baquacil, or saltwater system and all covered by the manufacturer. This is possible by the maker using as much resin in it’s construction as possible. 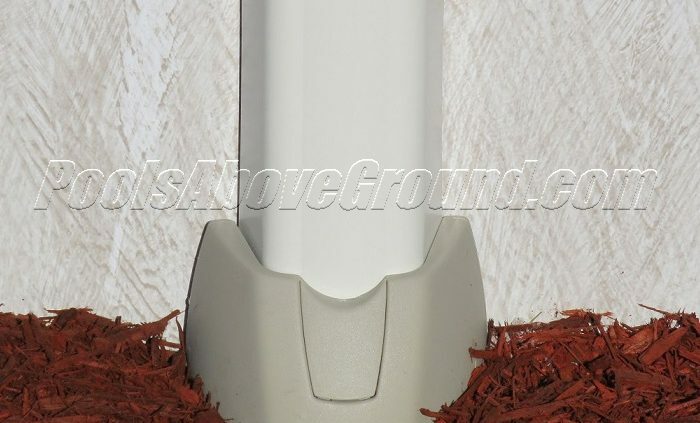 Inground Installation- Southern Sea is warrantied to be partially buried into the ground. Pools sunk into the earth are easier to get in and out of and provide a true inground pool look. Want More Info?- To buy Southern Sea pool or view pricing click here.